Considering the same environment like in the post Cisco: Policy Routing with IP SLA, there is another way to achieve the same behavior using again IP SLA and EEM (Embedded Event Manager). For those of you who are not so familiar with EEM please read http://www.cisco.com/en/US/products/ps6815/products_ios_protocol_group_home.html. You will find a nice explanation and some examples how to use EEM to achieve the desired result. EEM is based on a SNMP event. It is monitoring the OID value explained above. You may notice that at the end of the OID value, has been added another value .5 This is important as it defines the relation between EEM and IP SLA. In my case this number is 5, as the IP SLA session is defined, but in your case it may be different. This is checking if the TruthValue is 1 (true) or 2(false), on a 5 second interval and it’s applying the defined configuration. The EEM triggers on value 1 (true), so when the timeout occurs in IP SLA. Now the EEM is triggered on the value 2 (false), so when no timeout occurs in IP SLA. You might be interested in another EEM configuration, which send an e-mail notification when a certain condition occur. Check it here. Let’s assume that you have a Cisco router with 2 ISP connection. The first one it’s a 10Mbps connection with a decent latency and the second one it’s a 2Mbps connection with quite high latency. Since you don’t want to load balance over this 2 connections for the obvious reasons described above, you decide to to use the 10Mbps connection as the primary link and the 2Mbps one as a backup, just in case that the primary link fails. Of course, the easiest method would be to configure the a secondary default route through 2Mbps line but with a higher metric so it would be less preferred. In this case when the main line goes done the backup default route comes into play. But what if the main line doesn’t go down? Just there is no reachability to Internet or some branch offices? This method will not work very well. I believe you have an idea what IP SLA does. In this example it ping every 2 second the IP address 172.82.100.1 and it wait for reply (timeout) 1000ms before declare the host down. Pretty simple. I have a track number 1 which tracks IP SLA session 5 for reachability. and this will work correctly. Small hint: You saw that in the IP SLA I’ve specified the interface from which I want to ping 172.82.100.1. This is not just a preferred method, but it’s mandatory! If you follow the steps above, when the backup default route will be in place, 172.82.100.1 will be reachable again, making the track 1 being true and setting the track 2 to think that the primary link is UP again, so it will retract the backup route through 10.10.10.1. Pinging with the source of the primary P2P link interface, you achieve the result that you want IP SLA 5 to be true only when pinging 172.82.100.1 through the first line. Remember that we are not using dynamic routing protocols. In case you didn’t catch this until now Gi0/0 is the 10Mbps link and the Serial0/0 is the 2 Mbps. Another method to obtain the same result will be to used EEM with IP SLA which I will present in some future posts. 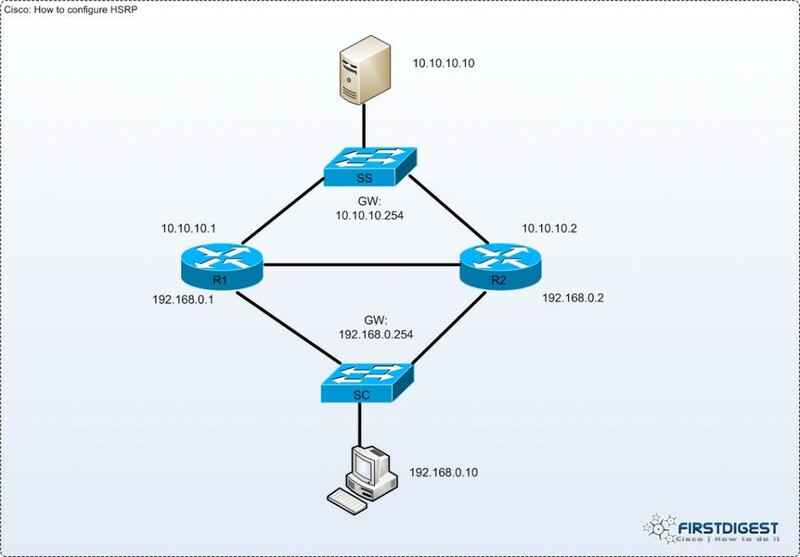 Fourth part from IP Routing Overview. I had in mind this scenario due to the fact that the traffic can take multiple paths in case of link being down and this give us the possibility to have a little bit of conversation on HSRP topic. HSRP is defined in the document RFC2281 and according to the definition in this document: “The Hot Standby Router Protocol, HSRP, provides a mechanism which is designed to support non-disruptive failover of IP traffic in certain circumstances.” If you want to read more about the details how HSRP is working, please the RFC2281. I think there is not point in reproducing here what is already written there. 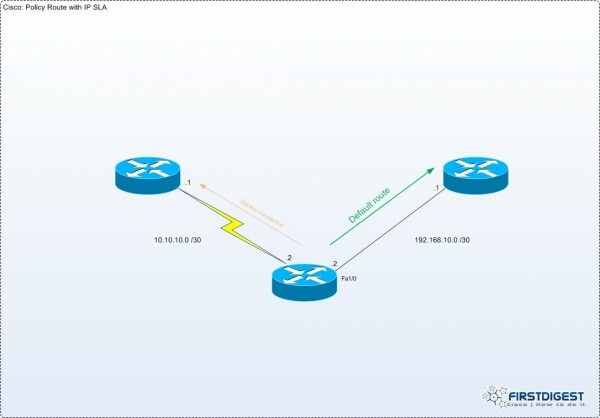 Regarding our topology, what you should know is that after configuring HSRP on R1 and R2 we will achieve a failover mechanism for the traffic from the Client (192.168.0.10) to the Server(10.10.10.10). From the beginning we will assume that R1 and R2 have the proper routing already configured to reach this destinations. So, how to achieve this behavior? From the topology you notice that proper configuration of HSRP involves 3 IP addresses from the same subnet (in our case this is 192.168.0.0 /24). One of the IP is configured on R1 the second one on R2 and the third one is HSRP IP address, which will be announced to the Client as gateway. First we configure an IP address on the interface. Then we configure HSRP by typing the command “standby” followed by HSRP group (in our case group 1) and then the IP address. HSRP default priority is 100, and the principle is the higher the better. To force the path R1-SC to be the preferred one, we increse the priority to 110, making R1 to be the “Active” one. The other router, in our case R2, will have the HSRP status “Standby“. Maybe you are wondering what happens if you don’t configure the priority and both routers are having the same value 100. In this case HSRP has a mechanism that help it to chose the active router by comparing the IP addresses and chosing the one with the higher value. In our case this would be R2 (192.168.0.2 > 192.168.0.1). where “somepassword” can be what ever you want. Remember that if do not have some routing between R1 and R2, the packets will be dropped on R1 as they will not have any path to the Server IP address 10.10.10.10.
will have a value of 80 which is lower than the default one (100), forcing R2 to become the Active router and changing the R1 status to Standby. All the HSRP configuration from this article can be fine tuned or extended according to your needs. I have presented here only the basics about the HSRP configuration. If you want don’t be afraid to explore and to “play” with the commands. Of course I would recommend to do that in test environment first.